Horseshoe Bay Part of the BC Adventure Network. Over a million web site visitors annually ! Horseshoe Bay serves as a gateway community to adventure on British Columbia's Westcoast. This very picturesque village is the West Coast ferry terminus for BC Ferries to Departure Bay in Nanaimo on Vancouver Island, to Bowen Island and Langdale on the Sunshine Coast. It is also the starting point of the Sea to Sky Highway that hangs on cliffs as it winds its way along Howe Sound to Squamish, Whistler and Pemberton. Located at the entrance of Howe Sound, Horseshoe Bay is a bedroom community for Vancouver and area with interesting shopping, a marina and full tourist facilities. Access: Horseshoe Bay is located northwest of Vancouver, British Columbia, where Highway 1 (Trans Canada) and Highway 99 (Sea to Sky) meet. It serves as the ferry terminus for BC Ferries for Vancouver Island (Departure Bay), the Sunshine Coast (Langdale) and Bowen Island. Recreation Facilities & Activities: sea kayaking, boating, scuba diving, hiking and sightseeing. 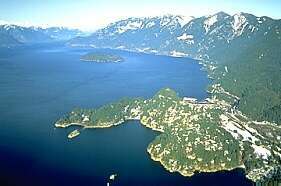 Local Attractions: Scenic Howe Sound, the Sea to Sky Highway, a marina, and the BC Ferries.